Burn'em Woods wood fuel sawdust briquettes produced in the heart of Perthshire from pure Scottish sawdust. 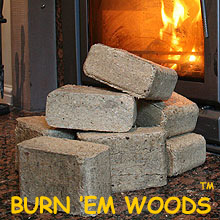 Our Burn'em Woods sawdust briquettes are made by taking dried sawdust and exposing it to extreme pressure. That's all! No additives, binding agents, glues or anything else. The result is a compact, renewable energy sawdust wood briquette fuel, with a constant moisture content, which burns brightly - without sparking or spitting - while giving off an abundance of heat and leaving little ash. Sawdust briquettes are ideal for wood burning stoves, open fires, chimeneas, fire pits and log burning central heating systems.